These words have been known to raise blood pressure, cause a grown woman to cry (either tears of joy or sadness), and provide a reason to consume a glass, or two, of wine. Once the announcement has settled, you are hit with the magnitude of those words — moving, PCSing, packing/unpacking. 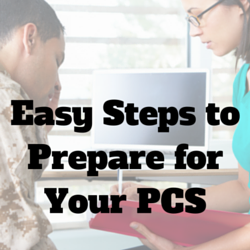 And whether you’ve PCS’ed one time or 22 times, moving is a stressful situation. The thought of uprooting your family and moving across the country or even across the world, giving up your sense of privacy as strangers rummage through your personal belongings, placing said personal belongings into the hands of even more strangers with hopes of everything arriving safely at your new home…this is enough to cause even the most cool, calm, and collected spouse to be a little stressed! Being a Marine Corps spouse for the past 23 years, I’ve had my fair share of moves. Looking back on those first couple of moves makes me shake my head and wonder, “Girl, what were you thinking?” Move #1 happened while my husband was deployed. Don’t ask why we decided this because, honestly, I don’t remember. Fortunately, the move was a quick jaunt down I-95 from North Carolina to South Carolina. Since we lived in a furnished apartment, I started sorting and organizing — what to pack and what not to pack. Needless to say, my “what not to pack” was a little smaller than my “what to pack.” I took everything but the kitchen sink with me — photos, clothes, my teaching materials, our china and crystal, plants, etc. My in-laws assisted with the move, not just for moral support, but because how else was I supposed to move 2 cars? So, between my car, my husband’s pick-up and my in-law’s van, we were packed to the hilt. I still get a smile on my face thinking of my mother-in-law driving down the interstate with a ficus tree in the passenger seat! I’ve become better organized since that first move. My moving arsenal, as I like to call it, has evolved with each move. The most important item is a notebook. In the beginning, it was a small notepad, but has since grown to a 5 subject notebook. Some people create a PCS binder, which is another great way to organize for a move. My notebooks (yes, I buy a new one before each move) have fluid sections, as they change with dependent upon where our next home will be! As most people do prior to a move, I sort through our belongings, separating items to sell, donate, and keep. Where we used to host yard sales prior to each move, social media has now become the best outlet for selling our unwanted or outgrown wares. The rest is donated. Next, it’s on to organizing! I admit that I am a bit OCD and that can be both a help and a hindrance when it comes to moving. My method of organizing entails gathering like items together so that they can, in theory, be packed together. Pictures are removed from walls and shelves. Carpets are cleaned and rolled or folded and stacked in a corner, and so on. May not be good for the environment, but great for moving. I use them for almost everything…kitchen utensils, pens/pencils, junk drawer dwellers, etc. I even put my unmentionables in bags — who wants movers touching those? My bags range in size from snack to 2-gallon, and the majority of them have been around for 10+ years. Talk about reusing! Colored duct tape is also a moving staple. There are hundreds of colors and patterns to choose from. Each daughter has a color, along with the kitchen, garage, master bedroom…well, you get the idea. There is even camouflaged duct tape which is perfect for marking my husband’s professional gear. At our new home, signs with the colored tape are placed on rooms so the movers have a visual of where boxes should be placed. Is this method fail proof? No. Boxes for the garage end up in the bedroom, kitchen boxes are found in bedrooms, and so on, but overall it is successful! Why do I work so hard? Why am I doing the work of the packers? Why am I making it so easy for them? I’m not. I’m making it easier for me and my family. Admit it…how many times have you found a pen wrapped in 10 sheets of paper? Or loose screws and nails bundled together in wrapping paper and stuffed into a box? Taking the time to organize and prep in my special way for a move makes the daunting chore of unpacking easier and less stressful. And, before you ask, yes I do have my own method of unpacking. But that’s a whole other story…. Written by Anna Nemeth. Originally published by Military Spouse Magazine. Used with permission.